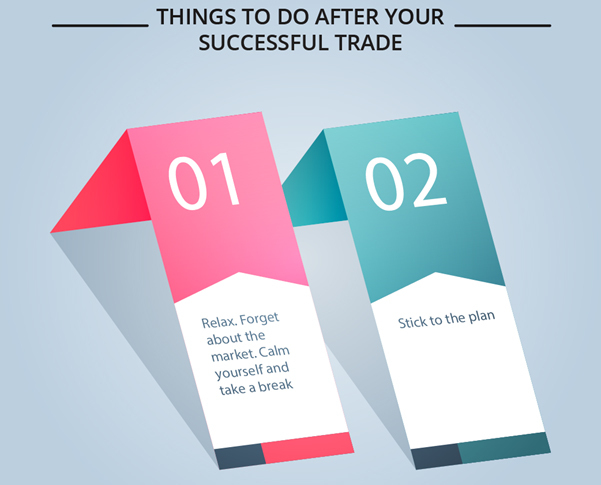 The first thing you should do after any trade — whether you win, lose, or break-even — is to forget about the markets for a while and relax. It is fascinating to participate in the stock markets as it allows you to reap benefits out of fluctuations. It is even more exciting when these benefits are enormous. However, while trading, one has to undertake several activities before, during, and after the trade. Before investing, one has to perform an in-depth analysis of the stock or the commodity. Once the trader is done with this research and has bought a position, it is time to wait. The trader waits for the right moment to square off the position or exit it. This exit point is also pre-decided, i.e. based on your analysis. What is usually neglected by most traders is the stage that comes after this, i.e., after exiting a position. The first thing you should do after any trade — whether you win, lose, or break-even and after you have tagged and recorded your trade and the trade analysis — is to forget about the markets for a while and relax. A winning trade gives the trader a boost and may lead to overconfidence. Similarly, a losing trade makes the trader want to ‘make-up-for-the-loss.' It might just not be the best thing to do. A trader might just take up positions in riskier assets like derivatives, futures, options, and so on. This decision might not pay off and might only widen the losses. Hence, the best thing to do after any trade is to remain disciplined and patient. Sticking to the trading strategy is the best way to go. Keeping all impulses and excitement aside, look forward to another excellent opportunity. Waiting for a while and overlooking the trade altogether helps one get refreshed and prepare for their next move. It is essential for any participant – beginner or seasoned. Impulses drive the market. However, as long as we have these urges under control, we can make the most out of trading. Relax, forget about the market, calm yourself and take a break. One needs to have complete faith in his/her strategies. Winning or losing should not hamper your trading plan.